Using the patent-pending technology control program “EYERESH”, the 3-dimensional videos can be played on all mobile devices. 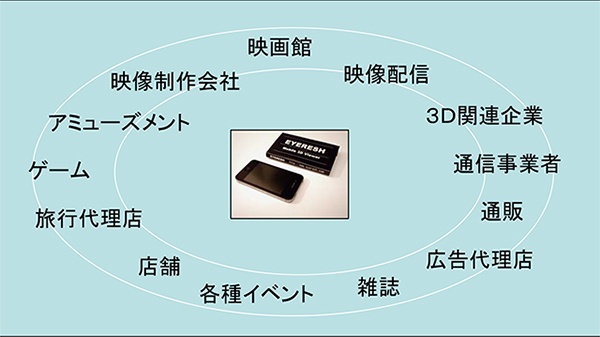 From the limited group that have access to expensive 3D equipment, it is now possible to convey the fun and excitement of 3D to the general consumer market who have access to a compatible mobile device. 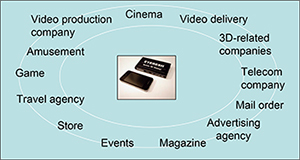 Sharing enthralling 3-D content to many users leads to increased WEB members. Attract WEB members whlist solving underlying issues related to 3D companies in the past. Symptoms indicating a potential problem viewing images in 3D can vary, but some common symptoms include headaches, blurred vision, nausea and dizziness. It has become increasingly difficult to protect the health of those who are constitutionally predisposed to dizziness, or those who can’t see stereoscopic images. The plan is to check the program guide of stereoscopic vision in international patent application at the same time as the proposal of the project to be carried out.